When I first started hunting it was only natural that I placed most of the importance on the type of gun, bow or crossbow I was going to use on a particular hunt. That perspective has changed significantly over the years as I have become a more experienced hunter. Now I realize that other parts of my hunting gear are just as important to me being successful on a hunt as is my choice of weapon. One of the pieces of gear I emphasize the most nowadays is the type of boots I wear. Why is proper boot selection so important on a hunt? I can tell you from personal experience that I am a much better shot when my feet are warm and dry as opposed to when my feet are soaking wet and I am shivering. The latter has cost me bagging a deer or turkey on more than one occasion. The proper pair of boots will help you stay on the hunt longer and help you enjoy it more while doing it too. To help you make the right choice in boots for your next hunt I have put together a list of some of the best hunting boots you will find in the marketplace. One of the most common types of hunting boots that you should own a pair of are called “field boots”. As the name implies they are great for crossing semi-uneven open terrain in fields and lightly wooded areas. These are more of an everyday boot that will serve you well for a large variety of different hunts. I have a pair that I use to hunt such game as deer, turkey and coyotes (a real problem near me). Just because you don’t hunt that often or have a limited budget for hunting doesn’t mean you can’t own a great pair of field boots. This nice pair of hunting boots from the reputable Red Wing Shoe Company should do the trick nicely. These boots, although on the inexpensive side, can still handle a hunt that goes into even the most rugged backwoods country. I hunted in these many times and had very good luck with them. My feet stayed dry and comfortable the entire time I was wearing them. I also felt my traction while using them was more than adequate. Even when I sat in a tree stand or stopped to search for game to shoot my feet stayed warm and comfortable. 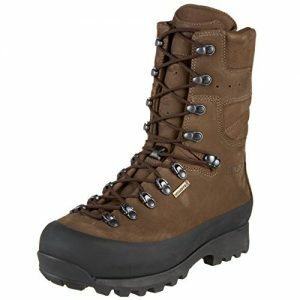 There was simply very much that I liked about these and I felt they were as good if not better than other more expensive field boots I had tried. 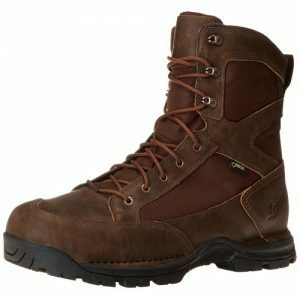 My overall experience was highly positive with these boots and I can clearly see why they were so highly rated by other users too. They were a really comfortable boot even after wearing them all day long. The waterproofing was exceptional also when going through wet snow or small streams. Even after wearing them many times the outer material showed very few signs of abrasions and the inner boot did not pick up much of a foot smell either. These boots are about as they good as they get when it comes to foot protection and comfort while hunting. They are a boot that is worth every penny of the price you spend on them and more. These are made by Kenetrek which is a company that rarely disappoints you when it comes to making hunting boots. They will work well for everything from doing target practice nearby your home to going after big game in the roughest territory. These field boots stay comfortable even after wearing them all day long. They also do an excellent job of keeping your feet warm and dry no matter what weather conditions you hunting in. The sole on these boots is made of rubber so it stays pliable even in cold weather so you always get excellent traction with them. No matter what type of ground I found myself chasing game over my feet felt very firmly supported too. The quality of the leather that this boot is made out of looks and feels far more supple than that of many other hunting boots I had tried on. The reinforced rubber sole guards provided an extended layer of abrasion resistance on the lower part of the boot. After wearing these on several hunts in some rigorous wooded areas the boots still looked almost new. Another impressive feature is how lightweight they felt when using them; that is rare for a field boot that is built this sturdy. The height of the boot and superior lacing were also big bonuses that made it easy to go through mud and cross small streams without having to worry about getting your feet wet. When you are shopping for a pair of field boots it is important to keep in mind the type of weather you may face at the time of year your hunt is taking place and the types of terrain you will be crossing on foot during your hunt. When traversing slippery ground or going over large stones and fallen branches, you will need a field boot with sturdy support to say the least. The arch of the boot and the ankle areas should both be well supported. This will go a long way toward preventing such things as twisted ankles and foot soreness during a hunt. Superior lacing will also add to the support of any field boot that you wear. Modern boot design that incorporates athletic shoe qualities into the design will be a big plus when it comes to comfort and support too. Since I am from a climate in the Northern United States where a lot of hunting takes place in colder weather, I always like to have a pair of field boots that are well insulated when on a hunt. There is nothing that will shorten a hunting day quicker and make it more unenjoyable than cold feet. Boots that have ‘Thinsulate’ type material stay warm yet it does not add to the weight of the boot. Be careful here. There is a ‘BIG’ difference between 100% waterproof, slightly waterproof and water resistant. Chances are at some point in your hunting excursion you will run into wet conditions so you want details on the exact amount of waterproofing in a boot before you purchase it. Look for boots that have some sort of waterproof membrane built right into them. Popular game animals such as deer have a very keen sense of smell to say the least. They will flee at even the smallest detection of a scent that is unfamiliar too them. Antimicrobial material will help keep your boots from building up with smells such as those caused by foot perspiration and other forms of bacteria that gets on them. I find there is a common theme when I hunt animals and that is a majority of the time at some point in the day they will be near water. That translates into the fact that you will end up near water sometime during your hunt too. This is especially true if you are active hunting. That is why during rainy, muddy and snowy periods you would be best served to hunt in a pair of specially made rubber boots. People often confuse waterproof boots with those that are true rubber boots. You might be able to get away with crossing a stream quickly in non-rubber waterproof boots but you better not stop in that stream for long. It is quite the opposite with rubber boots because as long as the water is not above the cuff of the boot you will never get wet even when standing in water for a long time. 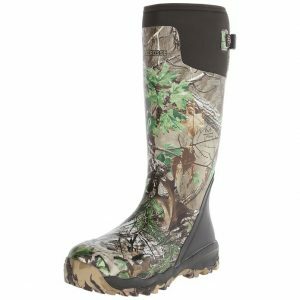 Rubber hunting boots also come in handy during such things as duck hunts and when going after other types of water fowl too. This is especially true if you have a duck blind set up right on the water. With rubber boots you won’t have to worry so much about getting your feet wet when entering and exiting the boat to do such things as pull it up on shore. Wet feet can spoil what should have been a pleasant day hunting by making you so uncomfortable you will need to go home hours before you were scheduled to. You know I had a friend once who always used to show up for our hunts wearing the latest top of the line hunting gear. It seems that every photo we took of him he had this outstanding looking gear on. There was only one problem; he was never in any photos with trophy animals because he never bagged any. Moral of the story; you don’t have to spend a lot of money to be a successful hunter but you do have to feel good while you are out there on the trail. This nice pair of moderately priced rubber boots is a great example of that. They are environmentally resistant and comfortable to use on almost any type of hunt. This is especially true if you will be hunting in wet conditions. Cold feet are ok before a wedding but they are the last thing you want out on the trail. What did I like about these boots? For an inexpensive pair of all synthetic boots they had a great feel to them. When paired with a nice set of insulated socks they were snug and warm all day long. The seal around the top of the boot gave me confidence that I could pretty much expect to keep my feet dry all day too. The traction with them was good and it was not uncomfortable at all to balance yourself and shoot when wearing these boots. Maybe you are the type of outdoorsman who doesn’t like to take chances with their footwear. 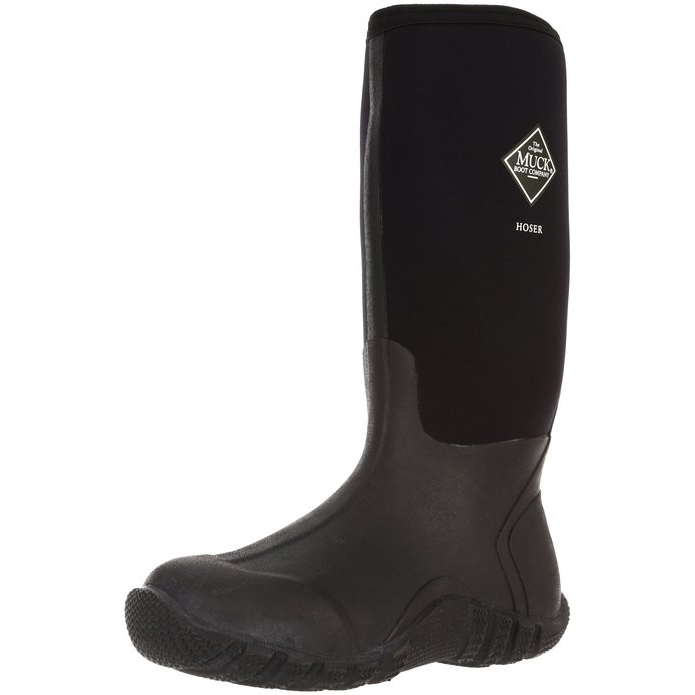 Well you can spend a little more and get into a superior quality rubber boot like these. They are a knee-high,100% waterproof pair of boots from the popular boot maker LaCrosse that will leave you very satisfied with this purchase. They combine both the superior looks and feel that are necessary to give you a quality hunting experience. These boots feature a very nice camo design on them that will compliment any other hunting attire you decide to pair them. The feel of these boots is also greatly enhanced by the fact they have now substituted and embossed neoprene liner in place of the old thick wool one they used to come with. It was one of the main reasons I did not wear the older version I had of these much when hunting because they got way to warm. Another quality feature with these boots is they are extremely flexible. They did not restrict me at all as I was walking or when trying to quickly get into a good shooting position. To me having flexibility in a waterproof boot when hunting is a huge bonus. I mentioned with the last boots that I crave flexibility in a boot even if I am hunting under wet conditions. The answer to that dilemma can often be found in a pair of mixed rubber and nylon boots. This good looking pair of MuckBoots fits my flexibility requirements nicely and are still plenty waterproof under even the wettest conditions. These are another pair of very high boots that will reach almost to your knees, so traversing small streams and going through even the muddiest fields are nothing you have to worry about when hunting in these. It is one well-built and tough boot that feels incredibly lightweight when you are moving around in them. If you don’t want to take my word for how nice these boots are then read some reviews from other hunters that have tried them. You would be very hard pressed to find a negative review about them and few hunting boot products are this consistently highly rated by those hunters than own them. This rubber hunting boot would not be a bad purchase for any serious wet condition hunter. Those I hunt with and I rarely agree on everything about hunting gear but we have reached one consensus opinion on hunting boots and that is we strongly prefer real rubber boot soles over ones made with synthetics. Why are we all in agreement on this? It has much to do with the fact we hunt under many cold weather conditions. Synthetic boots don’t stay pliable when temperatures get near freezing so they tend to lose grip easier and can be slippery. Extreme cold does not affect rubber boot soles the same way at all and they stay pliable and provide good traction under any weather conditions. On most type of boots they can get away with having a thin lining because the manufacturer can put padding into the boot in other places such as the tongue to help with comfort. That is not possible with rubber boots so you will then be relying on the lining insert to provide all the comfort of the boot for you. That is why you want to buy a pair of rubber boots that has a good padded insert to line the boots. Why rubber boots over other styles when you are hunting under extremely wet conditions? Boots that are not made of single piece rubber are never truly ‘waterproof’. They have places where they need to be tied, membranes that can fail, seams that are not always watertight or treated material that may not always handle the job of keeping water out. Only one piece construction rubber boots truly offer you 100% waterproof protection when hunting under wet conditions. 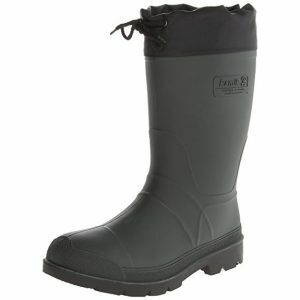 One of the best qualities of rubber boots is that they are generally much higher than other types of hunting boots. This extra height can often mean the difference between a satisfying hunt where you felt relaxed all day and one in which your feet got extremely wet and uncomfortable. A taller boot will guard you better against splashes, snow on low hanging branches and wet grasses after a rainstorm. Any advantage you can give yourself to stay dry on a hunt is a big bonus. One of the best ways to feel secure your feet won’t get wet under any conditions when hunting is to have a means of tightening your rubber boots around the collar. This is essential for rubber boots as opposed to other styles of hunting boots because they would be uncomfortable to wear if the rubber itself was made tight in the collar area. By having a padded feature that allows you to tighten them at the top you will be safe even from rain and snow getting coming from above getting into them. This one sounds a little misleading at first. After all who wants a special pair of boots to go hunting snakes? What snake hunting boots really refer to is a boot that offers you protection if you are going hunting or fishing in an area where many venomous snakes call home. If that is the case these will help protect you from unexpected snake bites. You may raise your eyebrows at this but there are certain areas where people hunt that these boots might just save a life. A Hunter being bitten by a snake happens much more often than most people are aware of. Chances are if you are hunting you are far away from the nearest hospital and with a venomous snake bite time is critical. Snake boots are also very high, given the fact over 95% of snake bites occur below the knees, so by wearing these you have just significantly decreased your chances of suffering a fatal snake bite while hunting. I read a few years ago about a group of men who went hunting for mule deer in South Dakota. One of the area ranchers recommended to them that they don’t go out hunting in that area without snake boots because he had never seen the rattlesnakes in that area so active. The group of men politely thanked him for his advice and went about their hunt. Sure enough, a few hours later one of the men was bitten by a rattler; luckily he was only grazed. Although rare, snake bites can and do happen and boots like these from LaCrosse may save your life. Not only that, they are extremely comfortable and easy to hunt in so you will get the best of both worlds. These boots will do much more than just protect you from snake bites also. Snake boots lace up very high so they have to be made of more flexible material than other types of boots. This allows for a generous amount of freedom of movement. It also takes high quality materials such as leather to make snake boots so you know they will last you a long time for the price you pay. It is a boot that is designed using what LaCrosse calls Hyper-Dri™ technology; that is material that is specifically designed to keep moisture out while at the same time is still breathable so your feet stay dry. 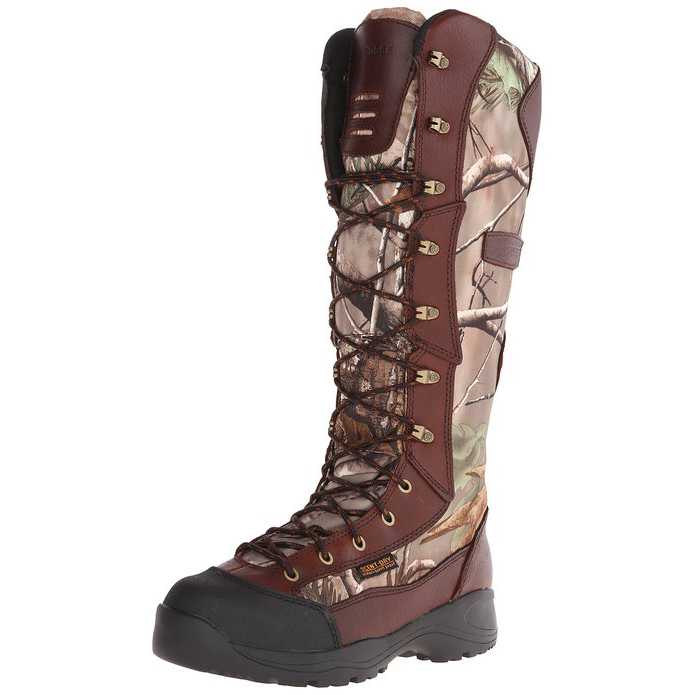 They are a great looking boot too with stylish camo material highlighted by leather accents. Hunting is no longer just a sport for men and many women now enjoy it too. It is a great way for a couple to bond or just for any woman getting a thrill from being one in nature the same as any man does. Although no woman has ever joined in any hunt I have been on, I have shot my rifle at a gun range before next to some ladies who had a much better aim than I do. It’s a fact the subtle differences between men and women and the way the dress for everyday life still remain even when it comes to hunting attire. I hope none of my male readers get offended but women demand their dress to have a little style to it even when going out on the trail after big game. 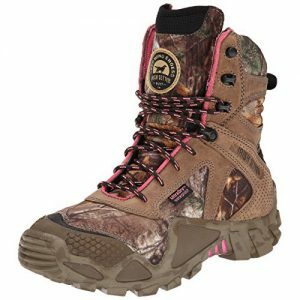 More hunting gear manufacturers have acknowledged the fact that more women are hunting these days by putting out such things as hunting boots designed specifically for the ladies. The following are some excellent choices in women’s footwear for hunting. Of course women’s hunting boots are a little hard for me to try on but I have examined thoroughly several different pairs of them. I will try and combine my opinion with those from several different reviews I have found online. Many of the traits you like to see in women’s hunting boots are also similar to those any man wants in their boots. This fact helps me greatly in my evaluation of them. If you are a woman who joins in on some active hunting or gets no thrill from staying in one place too long when hunting, then these excellent field hunting boots are a product you will definitely be interested in. They are built sturdy but no so much that they restrict your movement a lot when tracking or positioning. The sole is rubberized and cut like many men’s boots so it should provide the similar good traction that they do. For the lady that has to look good even when stalking game in the woods these boots look very stylish too. There is just a very slight bit of pink to compliment the camo and other natural patterns that are designed into them. Most women may like a little bit of style built into their hunting gear but they also like to keep dry too. If you are a woman who hunts during the rainy season, in wet areas or when it snows then these are the perfect boots for those occasions. These excellent pair of MuckBoots can get you in and out of even the wettest terrain and still leave your feet dry and comfortable. They are a pair of boots that come with a nice layer of insulation also so they are suitable for most cold weather conditions. The insulation is composed of a combination of 4mm of CR-foam built into the boots and added insulated pink mesh inserts. They also feature excellent and comfortable sole support in the form of EVA foam padding. When hunting under even the wettest conditions this reliable pair of quality boots will keep you perfectly dry yet still leave you looking feminine while doing it. 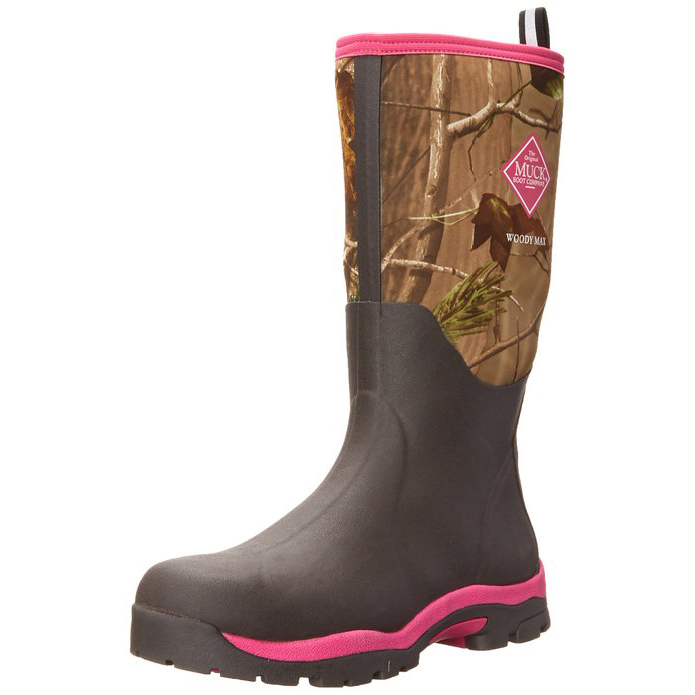 They have just a hint of pink accents to compliment the natural black and camo material that adorns the rest of the boots. I am lucky because I get a lot of free boot samples to try out because of the fact I write reviews on hunting equipment. That was not always the case and like many hunters at one time I had just one pair of “do it all” hunting boots. Most of the hunting I was doing was for deer in November in upstate New York so it was only natural I would own a pair of hunting boots made for cold weather. I threw these on my feet one day before going bow hunting in October on a bright 60 degree weather day; let’s just say when my day ended my socks were soaked with sweat and the odor was something I never thought I would get out of them. I now realize that any hunting that is done in warmer weather needs a special boot to do it in. Warm weather hunting boots should include such features as being lightweight, lightly lined and made from extremely breathable materials. They are also usually a much lower boot than those you would wear at times of the year when the weather is much harsher. Danner has really gone all out to make a tremendous warm weather hunting boot here. Whether it’s by coincidence or by design they have managed to put together just about anything you could possibly think you would want in a warm weather hunting boot. I am not much of a warm weather hunter but I might do more just so I get to wear these great boots on a regular basis. They are really that good. Why do I feel this way about this boot? For one everything about the construction of them seems very solid. The leather and cordura outside fabric makes them very tough and abrasion resistant. Plus the Gore-Tex waterproof membrane will keep you dry but does not add significantly to the weight of the boot. These boots lace up tight for added support and the nylon shank offers sturdy but flexible support too. 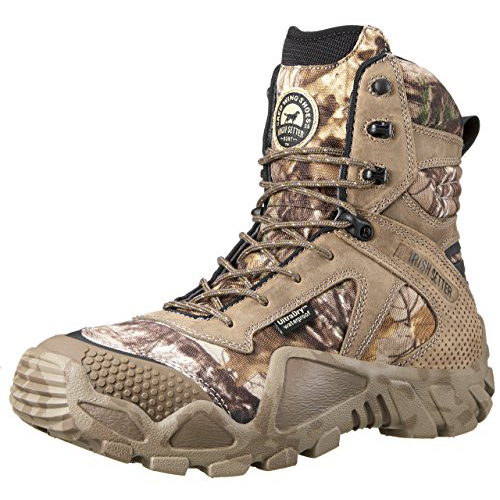 Since these boots are only 8” high that means you will remain very agile and unrestricted when hunting in them. I know that the few times I have hunted in warmer weather that has been important because the game I was chasing was much more active during warm weather conditions too.